8 Days Kenya & Tanzania Safari to Lake Nakuru, Maasai Mara, Serengeti, Ngorongoro & Lake Manyara presents ideal opportunity for wild game viewing, birding, culture and sightseeing encounters. The Millions of Flamingos at Lake Nakuru, the Rift valley views, Millions of Wildebeest in Maasai Mara and Serengeti, hundreds of thousands of Zebras and Thompson Gazelle in the two destinations, tree climbing lions in Lake Manyara, Maasai cultural tours and heritage encounter at Olduvai Gorge coupled with amazing scenery of Ngorongoro Crater offer rewarding Africa safari memories. 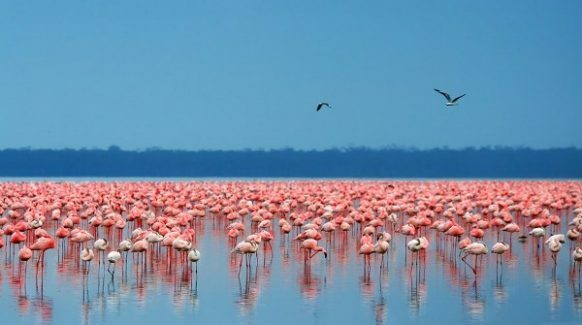 Set off from your place of stay in Nairobi after breakfast transferring to the World’s greatest Flamingo haven – Lake Nakuru. The drive offers magnificent scenic encounter en route with the sights of the Great Rift Valley and its escarpments not forgetting series of water bodies like Lake Naivasha. Upon arrival at Lake Nakuru, you take on bird watching activity enjoying millions of flamingos that feed on the algae along the lake shores. Besides birding, there is wild game like Rothschild giraffes, Baboons, Warthogs, Eastern Black Rhinos and Southern White Rhinos. The evening will be spent at leisure enjoying the soothing lake environment. After breakfast, transfer to Maasai Mara National Reserve while enjoying the scenic landscape along the journey. Settle for lunch at the lodge and do an afternoon game drive exploring the magical savannah stretches of Maasai Mara dotted with myriad of wild game and the sun set views. 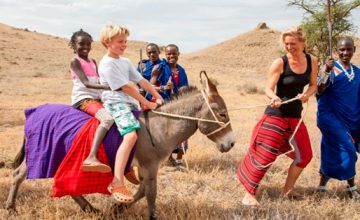 This is dedicated for an extensive exploration Maasai Mara National Reserve one of the Great wildlife viewing sites on the continent of Africa. 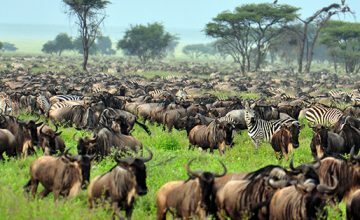 The Millions of Wildebeest, the Big five (Elephants, Lions, Leopards, Buffalos and Rhinos), hundreds of thousands of Zebras, Thompson Gazelle among others thrive in Maasai Mara. Other predators like Hyenas, Jackals and Cheetahs may also be explored. 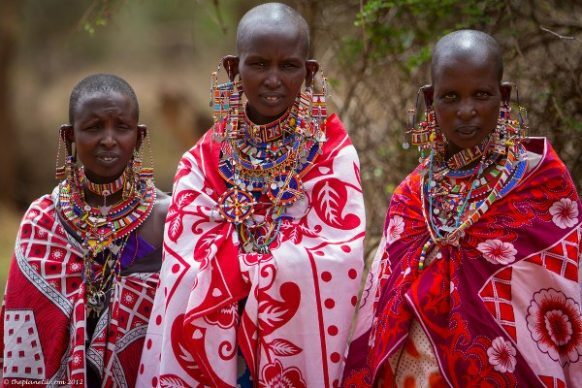 The evening can be spent at the Maasai community famous for their ancient nomadic culture, unique art and craft, the body adornment, Manyatta houses, dance and drama among others. Set off from Maasai Mara National Reserve and transfer to Serengeti National Park crossing Isebania border where the Immigration formalities will be settled and the vehicles changed. Proceed on the drive to Serengeti National Park and do an introductory game drive in the evening. The extensive wild game exploration in Serengeti National Park commences after breakfast. 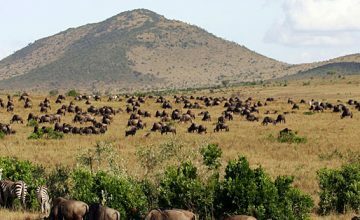 Serengeti has great counts of Maasai Lion, African Leopard, African elephant, Eastern Black Rhinoceros and African Buffalo, Grant’s and Thompson Gazelle, Wildebeest, Eland, Topi, Spotted hyena, Waterbuck, Striped Hyena, Impala, Baboon, East African Wild dog among others. Over 500 bird species thrive in Serengeti including Kori bustards, Ostrich, Crowned cranes, Secretary birds, Martial Eagles, Marabou storks and Love birds along with a range of vulture species. Drive from Serengeti National Park following breakfast to Ngorongoro Crater. 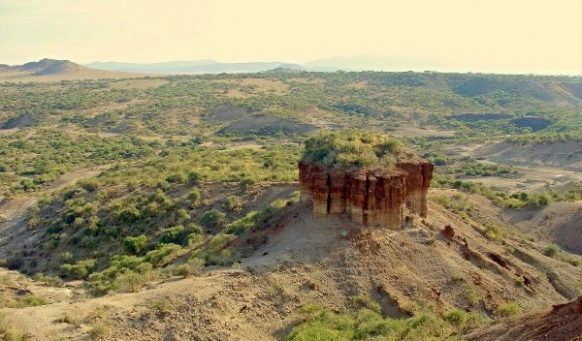 With the lunch box, you take on a scenic drive exploring the beautiful landscapes before making a stop at Olduvai Gorge to visit the Museum detailing the archeological discovery at the site which included the skull of the early man. 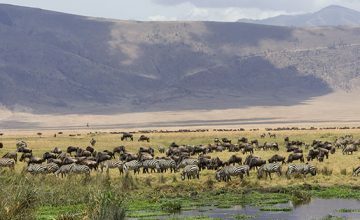 You proceed on the drive to Ngorongoro Crater for an afternoon crater exploration with the views of world’s largest intact, inactive and unfilled volcanic caldera, whose floor supports over 2500 large animals such as Black Rhinos, Elands, Lions, Cheetah, Elephants, Hippos among others. Following breakfast set off for the transfer to Lake Manyara National Park enjoying the impressive countryside landscapes including the views of the Rift Valley. Settle for lunch upon arrival and in the afternoon, you embark on an extensive game drive gaining chances of viewing tree climbing lions, the Elephants, Cheetahs, Dik-dik, Blue Monkeys, Hippopotami, Gazelle, Maasai Giraffe, Zebras, Impala among others. Over 400 bird species thrive in the park thus offering good bird watching opportunities. Do another early morning game drive after which you transfer to Arusha marking the end of the safari.